We want a healthy future for ourselves and for the planet. A future that ensures our children live in a world with fresh air, abundant forests and a stable climate. One where all people have access to clean water and wholesome, nourishing food to eat. Yet our future is being critically threatened by industrial meat and dairy. Intensive production of livestock is tearing down our forests, polluting our water, shifting the climate and putting human health at risk. Our appetite for cows, pigs and chickens is devastating the world around us and it’s being driven by a global industry of corporate actors who put profits before people and the environment. And while they are the major culprit, we too play a role in this problem — we are simply consuming too much meat, and it’s creating widespread impacts on our sustainable future. The choices we make about our food matter. Greenpeace is joining a global movement to transform our food system before it’s too late. We must significantly reduce global meat and dairy production and address the way animals are raised and treated. Yet it’s not only vegans and vegetarians that are helping to change this broken system, it’s reducetarians, flexitarians and climatarians — it’s you! We can all be part of the solution through our food choices on a day-by-day, meal-by-meal basis. Together we have the power to break the cycle of industrial meat production by choosing to eat more plant rich foods, and by using our collective voices to call for lasting change. When we speak up, we can challenge the companies that put profit over our health and the health of the planet. Let’s demand a global food system that is fair and sustainable for farmers, animals, and the environment. And let’s start in our own communities. We must act now. Come join us! Industrialized livestock is one of the most powerful industries on earth, made up of a few highly-integrated corporations that dominate the global market. With the help of government subsidies, public funds, and the prominence of cheap meat in schools and public institutions, we live in a world where the industry largely dictates what we eat, leaving the consumer with little control over choice. Corporations are guided by one fundamental principle: feed and slaughter animals as quickly as possible, by whatever means necessary to maximize profits. To achieve maximum profits, factory farms keep livestock in unsanitary and highly dense confinement, overfeed them and pump them with incredible amounts of antibiotics. Not only do these production methods deny animals of basic dignity, but it’s causing a public health emergency. Intensive livestock farming contributes to antibiotic resistance through the overuse of antibiotics on healthy animals. Also, meat is literally making us sick. Food-borne illnesses — spread by the way livestock is processed, manufactured and distributed — are creating a global public health issue across the globe. Fixing our broken food system will be no easy task, but in order to avert catastrophic changes to our climate, forests and freshwater resources, we have no choice but to significantly diminish factory farming, and change the kind of meat and dairy we consume. 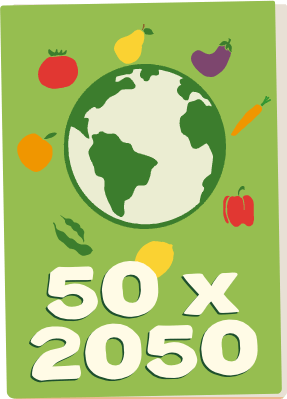 Greenpeace is ready to confront these critical issues with one clear and ambitious goal: to reduce meat and dairy production and consumption by 50% by 2050. We are at a critical juncture where we have to decide if we continue living in a world under the constant threat of industrial farming or choose a bold, healthy vision for the future we want, and the one our children deserve. A world with less meat is not only possible, but it’s becoming a global movement with millions of people who are consciously choosing to eat more creative and delicious plant-based meals — foods that that provide better health and a greater variety — and they’re loving it. All of us need to help push for lasting change. We’ll need your voice as we confront corporate players while urging governments to shift food policies that are designed to support better quality meat and more plant-rich foods. But we also need to bring this movement into our homes and communities. Think about how much meat you consume and how you can start to eat less. Do you know where your food comes from? When you eat meat and dairy, consider choosing quality by supporting ecological small-scale farms, which raise animals in a healthier environment, without excessive use of antibiotics. Each time we take a bite, we have the power to shape a new food system that embraces local farmers, protects our health, and heals the environment. This is our moment to envision a better future for us all. Greenpeace is present in more than 55 countries across Europe, the Americas, Asia, Africa and the Pacific. Greenpeace does not accept donations from governments or corporations but relies on contributions from individual supporters and foundation grants. Learn about our other campaigns on energy, climate, oceans, forests and plastics.